Ashen beaches, sky-scraping waterfalls, towering mountains, glaciers and blasted waterscapes are the promise of Iceland’s nature. 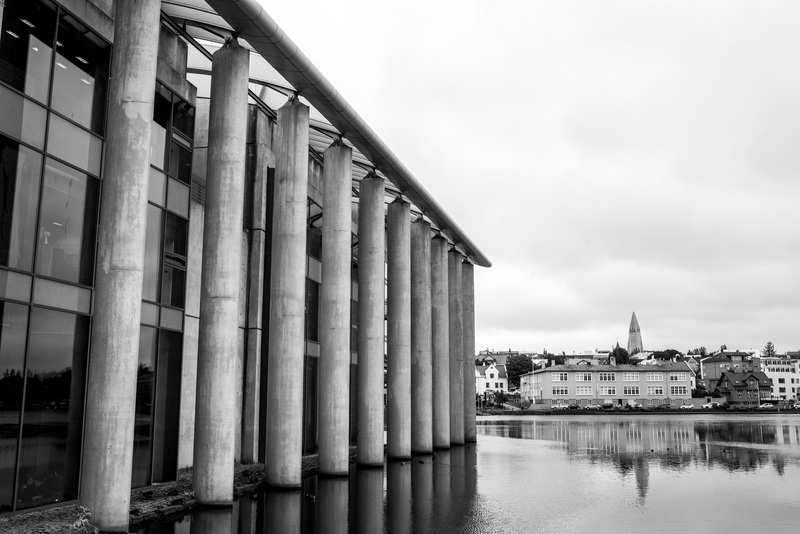 A promise that I could not see under-delivered by only spending some time in Reykjavik, as beautiful as it may be. Zoe rounded up the gang together: Her, Kailyn her friend from Australia, Gwyn, from upstate New York and Martin, from France. We met up early morning at Thrifty car rental near the Reykjavik local airport for regional flights. Thrifty is probably your cheapest option in terms of renting something decent and not getting wrecked financially. Other providers offer cars with WiFi and the whole shebang. For us, a nice four-door jeep-style SUV with 4 wheel drive was enough. About 105€ including all-dressed insurance policy, automatic car, and young driver fees. Not too bad considering a bus ticket for the ring road tour is 90$ USD and we were 5 splitting the 105€ bill plus less than 100€ worth of gas. We each spent under 50$ for our journey. Give or take 5,000 Icelandic crowns. With our tires on the asphalt, we were ready to go. Straight to Vik and its black sand beaches. Maybe we would luck out and catch a glimpse of a Puffin or two. We couldn’t help but stop at one of the waterfalls. Seljalandsfoss. Located on route 1 on the western side of Iceland, which was our itinerary for the day, we stopped midway. As grey as the day was, and as blasted as the landscape along the road was. This was a sight for sore eyes. At about 200ft high and taking its origins directly from the waters of a Volcano Glacier, it was hard to resist snapping a picture. Walking behind the fall, however, is a guaranteed bath. The day becoming ever more grey as time passed, we decided to push on. We stopped here and there for quick photo ops, the skies always changing hues. Rain here, the sun hidden behind a curtain of clouds there. The rare blue skies we had were the perfect opportunity to catch a decent shot. We also totally did not waste near 15 minutes on the side of the road chilling with horses. Taking pictures along the way, while driving under the rain was hard. But fortunately, we were near Vik after only a few hours. Vík í Mýrdal is almost 200 km away from Reykjavik along the southern road commonly known as the Ring road. With less than 300 people living there, it is really not what could be considered a big town. However, being the only place around, it attracts its fair share of tourism and business. There we stocked up on food and supplies and decided to see the famous shoreline. With its surreal shores made of black sands and the Puffins nested alongside the cliffs, the beaches were an interesting place to see. 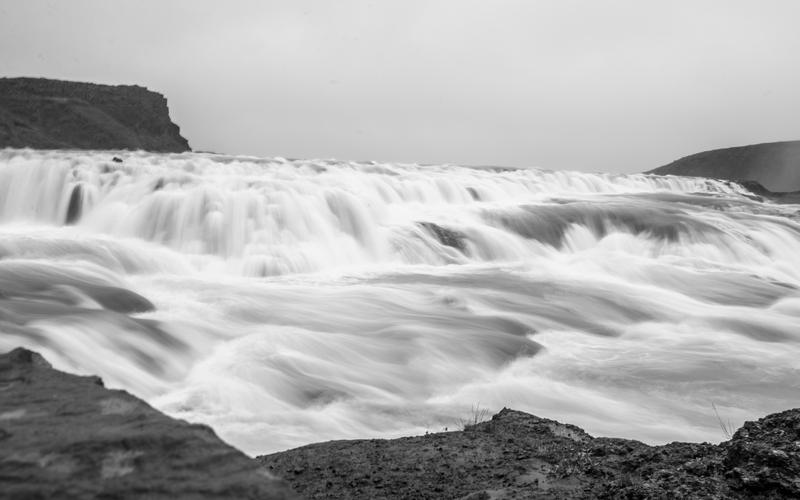 Strong winds, rain and walking on black sand made it extremely hard to take the time to make a nice image of the place. Iceland was definitely somewhere where you bring weather sealed gear, a tripod, and possibly a camper van. But I like to not really plan anything and see where it takes me. We did manage to get a few pictures of the naturally eroded caves as well as a group portrait. The cave provided adequate protection from the rain. A short respite from getting systematically soaked when it is 5 degrees Celsius outside. The local populace too seemed to take issue with the weather. Little did we know our next stop would be a spontaneous one. Completely unplanned. Walking down towards its “bay” was not so simple. A sign quickly informed us that normally a helmet, rope, studded boots and a certified glacier guide are required. We just decided to peak our noses a bit closer, disregarding the notice that also mentioned the last accident in details. While we did hike a bit towards higher on the glacier, the unstable terrain and another sign mentioning quicksands put the last nail in the coffin of our adventuring spirit. Seeing a group of travelers all geared up only two hundred meters away from us convinced us to walk back. We did get another awesome opportunity for a group shot tho! A last picture of floating icebergs and we were on our way. The landscape was so unfamiliar to me that while heading back to where we had parked the car felt a bit like walking on the moon. We had two more stops planned: The classic Geysir and the Gullfoss, probably the two most popular stops on our list. It was decided to keep them for last, hoping that the end of the day would lower the number of tour buses coming and going, leaving the place to self-organized tourists like us. After quite some driving, we were getting closer to the area with geyser activity. While driving we exchanged stories we heard of tourists getting hurt by doing stupid things in falls and Geysers. Did you ever hear of Darwin awards? Yeah. That. It is pretty clear at this point the ground and the water is hot right? Lucky enough, the “Geysirs” were happy that day and we had the opportunity to witness them to their full extent. With almost no tourists. We could see we were at the right spot just by driving near the park. 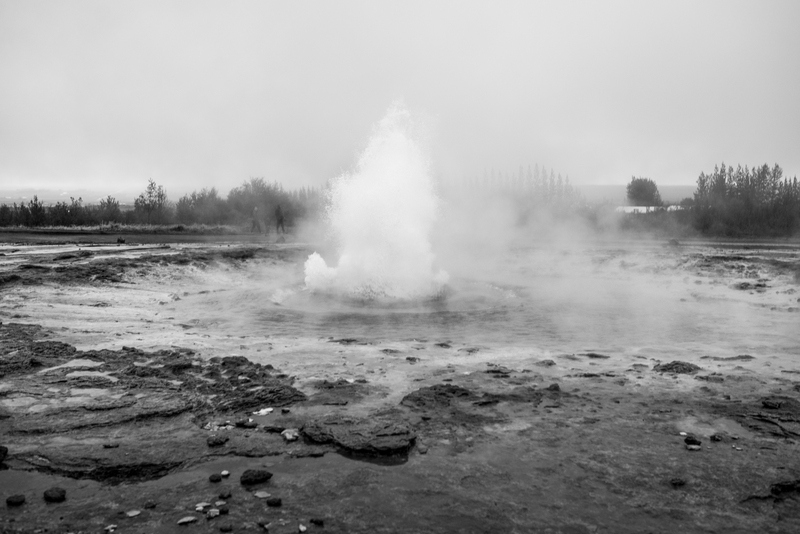 Geysir, the main one, erupts approximately every 8 minutes and sends boiling water over 70 meters in the air. 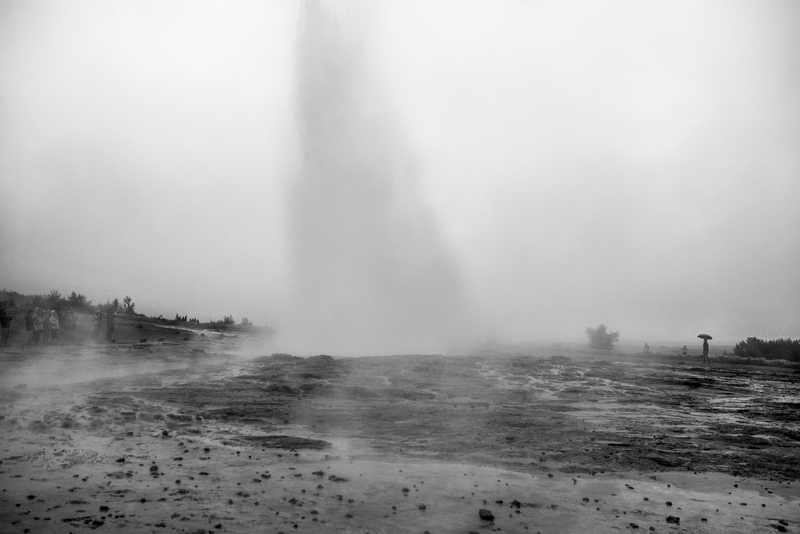 The phenomenon is where the word geyser comes from as it was the first one known. Can you find my road mates on this picture? Some pictures later and we were on our way once more. 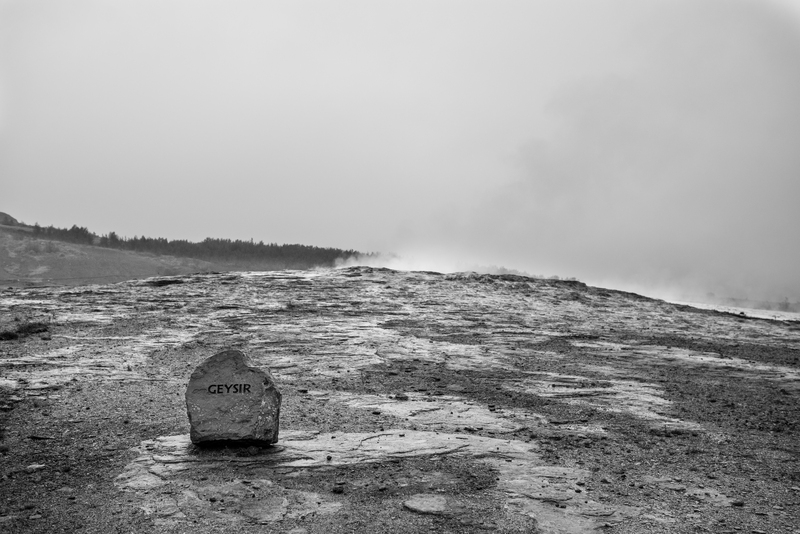 The last stop, but not the least, was relatively close to Geysir. The internationally known Gullfoss are a bit less than 20 minutes from Geysir. Water particles were flooding the air, you could hear the sound of the force of nature through the fall’s rumble. I took my time to try to craft a decent HDR rendering of the scene without a tripod. The contrasted photo below was the final result. Shortly after we sat in the car, pumped up the heat and headed to Reykjavik. I had some bags to make and was to meet my girlfriend at the airport in less than 8h. For the next morning, I was moving to Germany once again.